One day, one of my friends contacted me for a job offer. His company is hiring and he wish to recommend me to the manager. Let’s not mention about the company’s name. Hmm… it is a multi-nation company with M character in front, that’s all. So I think it is a great chances to try something different and it is a big company, why not give it a try, right? Well, since it is big and well-known company, I assume there will be a lot of submission other than mine. I need a special and attractive resume to impress the manager. Something like infographic to represent my resume will be great. Honestly, I’m not really good with design or photoshop, so I need something simple yet good enough to stand out from others. 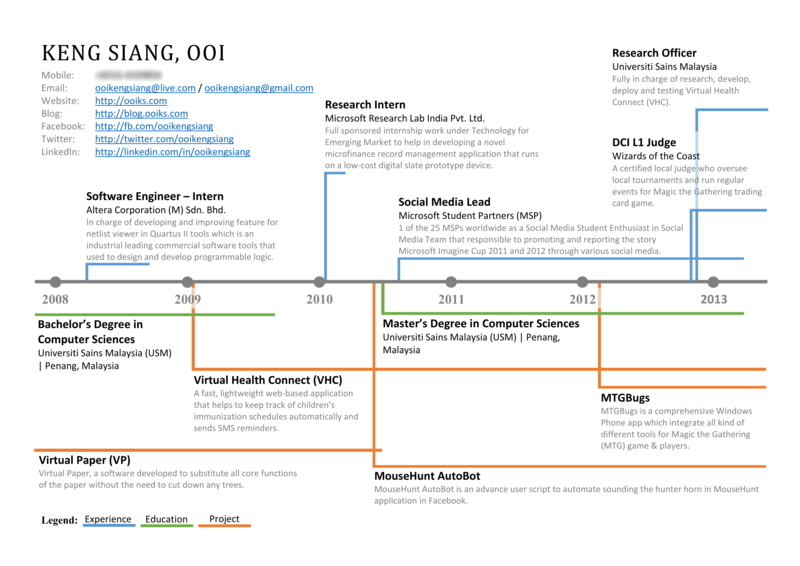 In the end, I choose to use timeline and map base design to create my own visual resume. Below are the first 2 pages of my resume. It is a summary of the whole resume in visual format. The first page show my working experiences, education and my own projects in timeline. While the second page show my worldwide achievements in a world map. I also afraid that some one might want to know more detail about my work from the resume, so I included another 6 pages of “boring” text base writeup with detail info after the visual resume.